Silver Arowana is the most common among all types of the arowana species and thus commands a much lower price compared to the likes of the rare super red and crossback varieties. An adult pet fish is usually sold within the price range of few hundred dollars (most of the time not exceeding $500) while some younger few months old to a yearling is offered for much less, between 20 to 50 bucks. The fish appears in a completely all silver color on its whole body starting from the head to tail except for its fins which may be slightly reddish during its juvenile period but disappears as it gets older. Caring for the silver arowana (sometimes called dragon fish) should be relatively simple as the requirement would be the same as with all other normal aquarium fish species with regards to water quality and tank setup. Most experienced hobbyists who have prior experience keeping other freshwater tropical fish should not have any problem handling and keeping them as pets except that demands for foods and nutrition might be slightly different. Compared to the other types of fish which will easily accept any food given to them, arowana being a predatory species has specialized requirement as they will need constant supply of live foods to keep them active. I did discuss about this topic before about the perception that arowana can only do well with supply of live foods but however, this is not entirely true as frequent feeding of high quality pellets made specially for predatory fish with protein content may also serve as good replacement. You can head over reading this article about the best recommended foods for your arowana pets. 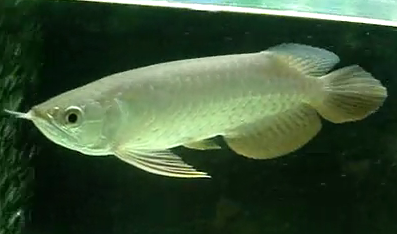 Silver arowana are known to attain at least 30 inches in length under optimum living conditions but there are also some documented accounts of wild caught species going as far as 50 inches but this only holds true if they are allowed to survive in mud ponds with constant supply of fresh clean water. On the contrary, domesticated species living in home aquariums can only achieve certain maximum size and it usually does not cross above 10 feet even though the right dietary requirements and other aspects of fish care are provided. Silver arowana life span if well looked after can survive up to 8 years minimum and it's not surprising that some live longer than that. Fish tank housing your pet should be at least able to hold 500 gallons minimum and consideration has to be put into the aquarium dimension especially on the width and not just the length alone, as the fish needs to turn and swim to the opposite direction. These are some of the things that you will need to put particular attention towards. Arowana are known to be susceptible to different types of disease. Usually the first sign that your precious pet might be sick is when they are not eating at all rejecting all foods given to them. Most of the problems are usually related to the feeding of live feeder fish which carries parasitic disease with them and somehow supply of tubifex worms are sometimes contaminated with viruses that can easily cause infection and upset their stomach. Drop eye is another problem most common among all affecting different types of arowara and is most prevalent for the silver arowana. Gill infections related that can deteriorate up to the extent of decaying is also quite common and so does cloudy eyes problem. Aquarist believe that all of these are actually related to the water quality and usually temperature of the water should not be kept too cold below 25 deg Celsius as it will make the fish susceptible to disease and infection. If problems develop, the best solution is to seek out medicated cures sold at pet stores and immediately check your water quality to bring it back to normal condition within the ideal temperature range. Related post covering similar topic of discussion: What makes Golden Crossback Arowana Special. Looking to add new friends from other species to your arowana fish tank? Why not check out the red-tailed tin foil barb as excellent community fish addition.